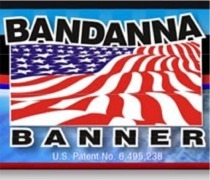 What makes Bandanna Banner so unique? An automated hemming system to accurately measure 1-inch hems and then simultaneously thermo-weld seams along top & bottom lengths without sewing. Then the automatic grommet system accurately measures, punches, and sets 2 grommets, spaced 3 inches apart every 24 inches along top & bottom lengths. Each roll is then rolled on a tube and boxed in standard 24 yard rolls. Lay-flat characteristics make it Fast “n” Easy when applying your vinyl graphics. Simply roll out the banner material in multiples of 2 feet, then cut between the patented “Double-Grommet” spacing, this will allow you to conveniently cut off the length required and have a grommet both at the ends of your first banner and the start of your second banner off the roll.Standard widths of 22, 34 and 46 inches. Must be purchased in 2ft. increments because of grommet placement.